Humanity seems to be obsessed with fictionalizing how we’ll ultimately be wiped off the face of the Earth. Whether it’s the dead coming back to life, Nuclear Armageddon, or natural disasters, it’s been the narrative focus of just about every medium at one point or another. It does create some intrigue though, doesn’t it? If an apocalyptic event did take place, what would it actually be like to try and survive in a world washed away? 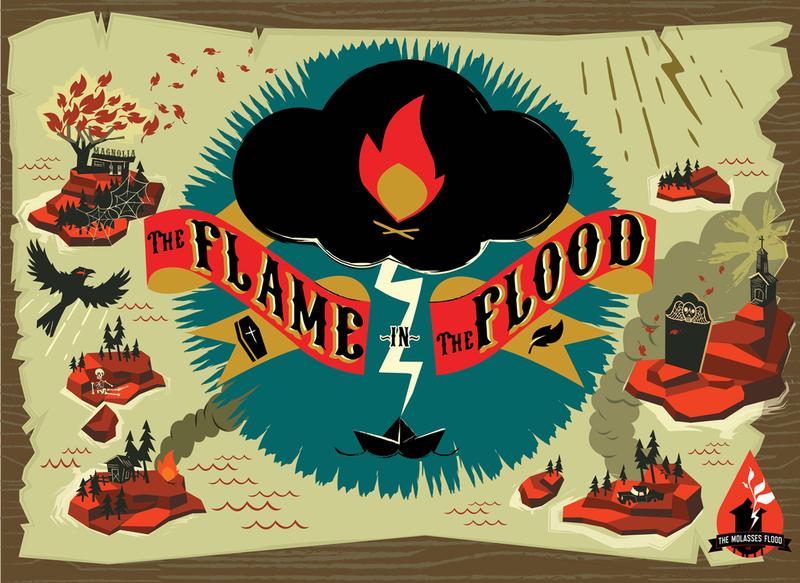 If The Flame in the Flood’s depiction is anything to go by, it would be one hell of a struggle. 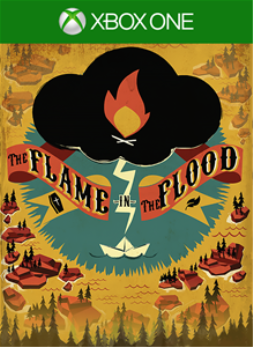 The Flame in the Flood takes place along a winding river in post-societal America. It’s not immediately clear what exactly has happened to society, but many indications point to massive flooding that has swallowed up a lot of landmass. Destroyed bridges and infrastructure line the shores while floating chunks of debris litter the water. Signs of continual human life are very scarce. The player is introduced to a girl named Scout and her faithful canine Aesop, whom after finding a radio with a garbled transmission, set out together to find higher ground and some sort of salvation. The overall setting and atmosphere are among the high points of the game. Both on the river and among the land-based stops along the way, nature is slowly reclaiming what humanity had once built atop it. It's a really nice contrast between the beauty of nature and the gradual decay of man-made structures. The feeling here is very much a backwater trip through any number of American regions. It's never specified where specifically this is taking place, but the mood continues to change with each new section. The game's soundtrack melds particularly well with this feeling, mixing together what feels like an up tempo "survival" tone with that backwater vibe to create a feeling of being completely on your own. The long path towards your goal is continually shrouded as an unpredictable mystery, thanks to the procedurally-generated landscape. Most of the journey takes place on a small makeshift raft that you’ll have to steer around obstacles and towards pit stops along the way. This is point-blank a survival game through and through. Stats including Hunger, Thirst, Body Temperature, and Fatigue have to be maintained in order to survive. This makes stopping at landmarks a necessity, because trying to gun it down the entirety of the river without stocking up on supplies is not going to end well for you. Let’s be clear; everything that Scout encounters on the journey, with the exception being the cute little rabbits and a few human survivors, is actively trying to kill her in a multitude of different ways. Throughout the campaign and Endless Mode, the player can contract a number of different afflictions and many of them, more often than not, end up killing you. Afflictions can arise from injuries inflicted by wildlife, conditions worsened by the weather, and ill-prepared food and water that you consume. Staph infections, dehydration, dysentery, broken bones, giardia, hypothermia, and parasites are among the many issues that drag Scout towards the brink of death. With as many stackable afflictions as there are, it’s hard to not recognize how complex The Flame in the Flood’s system can get. Death can, of course, also come from drowning if the raft takes enough eventual damage. Fortunately, there is an abundance of materials awaiting to be scavenged and crafted into the supplies needed for survival. While at the most basic level these materials may be cattails and pieces of flint, the more complex craftable items include bows and arrows, various traps to capture wildlife for meat, and more heavy duty clothing for colder temperatures and rainy conditions. These materials are scavenged at the a variety of landmarks that pass by while proceeding downstream. The theme of what to expect is dependent upon the type of area it is. Medical supplies are common at clinics, food and clean water are abundant at farms, and churches provide a nice place to stop and rest up to restore Fatigue. Marinas, on the other hand, are solely for repairing and upgrading the raft, which becomes much more of a necessity further down the river. While some materials really only serve a singular purpose, others are essential building blocks for many different items. As progress in the journey is made, strategy begins to seep into the decision-making of what to do with the scavenged materials. It also begins to have an impact on which areas you decide to prioritize visiting over others. While in the beginning it’s possible to visit most locations in a specific region, eventually the areas are so spread out that it just isn’t possible to make it across the river in time. As it turns out, the currents and rapids really don’t care about your need to resupply. This strategic approach is also always present when it comes to managing the supplies. Scout’s backpack, Aesop’s bag, and the raft only have so many spots for materials, even after upgrading them to the max. It oftentimes comes down to looking at Scout’s stats and making the determination of which one is going to be problematic in the near future. While managing supplies and crafting is mostly streamlined and simplistic, there are times where it can feel like an awkward burden. Some items can be moved quickly, but others seem to require individual movement to rid yourself of an entire stack of the same item. This can pose an issue since going into your inventory doesn’t pause the game, making it that much more difficult to clear space in the vicinity of hostile animals. The limited carrying capacity also proved to be an annoyance over time when having to reopen the inventory to manage the space over and over again. The game's quick select menu offers access to some of the most vital items that can really help in a pinch. Time and again, though, Scout would start moving off into the path of danger while merely trying to eat some food or apply medicine. 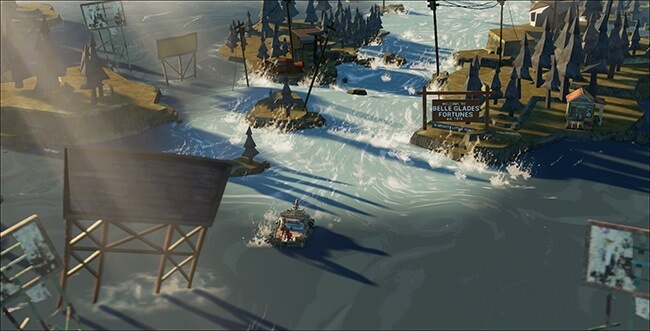 The Flame in the Flood runs smoothly the majority of the time, but there are a few bugs and other strange happenings. The player can get stuck while either lodged into a surface or caught up with another NPC. Without managing to become unstuck, the next resort is to exit to the main menu, which is especially problematic during the campaign when there are only so many checkpoints on the easier difficulty. There are ten regions along the river’s path that provide checkpoints, so if you happen to make it quite a way past one of them, a bug like this means having to backtrack several miles and losing all of your progress. Playing through the game on Survivalist difficulty, which features permadeath, would mean losing all progress up to that point. Interactions with hostile animals, specifically wolves and bears, is also quite strange. One helpful tool to craft is a torch that keeps these predators away. It feels somewhat out of place that a single torch could permanently help evade possible danger, and many times it bent the rules of the game itself. Torches aren’t supposed to work when it’s raining, but they seem to function just fine anyway. Essentially that meant running around with a wet stick and apparently wolves and bears are terrified of that. Torches are also only meant to have a limited lifespan before breaking, but one of the torches lasted for a majority of the journey. This never came off as a major problem, but it’s one that unintentionally eases up on the difficulty. 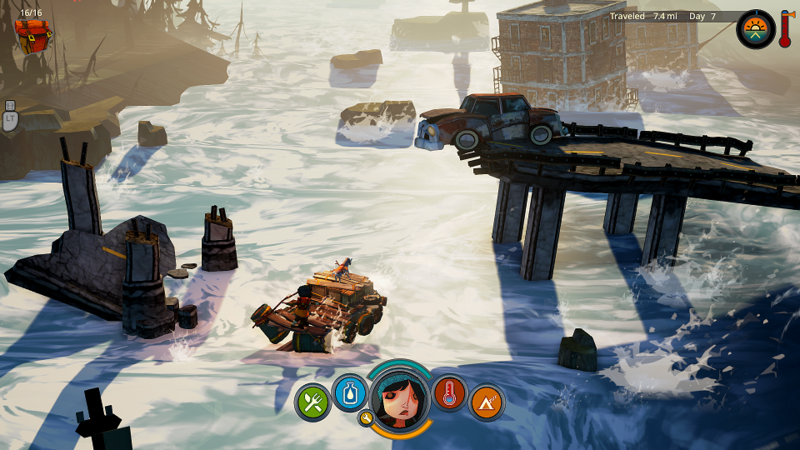 The Flame in the Flood is a game that may give achievement hunters a tough time in completing. The standard story-based ones aside, many of the achievements are going to push players to survive on a level that’s past what is even necessary. Two similar achievements challenge the player to survive for 40 days without eating meat and plants respectfully. Another tough set requires the player to survive for 100 days and 200 days in Endless Mode. It may be wise to plan on using Endless Mode for many of the achievements on the list; since the goal is to keep going for as long as you can, there should be plenty of time to work on many of the achievements along the way. 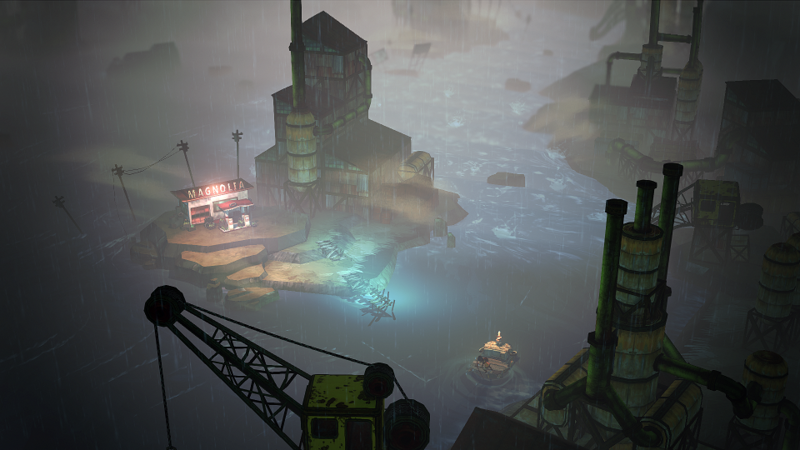 The Flame in the Flood does not afford the player leisure time to stop and take in the sights. The survival system here, complete with all of the afflictions that are actively working against you, is the high point of the game, and is something that continually presents the player with a real challenge throughout their journey. It’s a constant battle of intense survival where planning for the present and future is always a necessity. If we're really talking about the end of society, that's exactly how it should be. The reviewer spent six hours playing through the campaign and an additional four hours continuing the journey in Endless Mode. 11 of the game's 36 achievements were unlocked along the way. An Xbox One digital copy of the game was provided by the developer for this review.